8 Important Questions | Soundproof Windows, Inc.
Can I really get rid of the noise? Yes, living in a noisy environment adds stress and strain that negatively impacts your life. 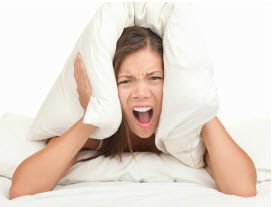 The constant distraction of noise can interfere with your sleep and make you tired and irritable. This can adversely affect your performance at school or work. Your relationships with others can suffer. Total it up and it means higher stress and an overall lower quality of life. It doesn’t have to be that way. Imagine the calm and relaxation you could feel in a low noise environment. Did even thinking that thought make you feel happier? Now imagine how much better you’ll feel when you actually experience freedom from the tiresome noise in your office or home. You can dramatically reduce the noise in your environment. And you can dramatically improve the quality of your life. There is an effective solution for reducing noise. It’s Soundproof Windows®. You’ll learn more on the following pages. Is the sound coming through my windows or my walls? The first step in solving any noise problem is to identify where the noise is entering your environment. Studies of hundreds of offices and homes show that a far greater amount of noise comes through the windows, not the walls.” While many people spend thousands of dollars on “sound proofing” the walls of their buildings, laboratory studies show that more than 90% of all the exterior noise comes in through doors and windows. Walls are almost never the problem. Chances are that’s true for you too. So, when it’s time to solve your noise problem, the place to focus your attention is on your windows. Will replacing my windows solve the problem? New windows may provide some improvement, but very few windows are designed specifically to reduce noise. You could go through all of the time and expense of replacing your windows and never really solve the noise problem to your satisfaction. An added drawback is that while new windows might provide some noise relief, they are not a viable long-term solution. Much of the noise that comes through windows enters through broken window seals. With age, and the normal slight movements that occur in your home when temperatures change, all conventional window seals eventually fail. The partial relief you might experience by replacing your windows is only a temporary solution at best. Will dual pane windows solve the problem? Dual pane windows are great for handling heat and cold. However, they aren’t effective at solving noise problems. The engineering needed for sound is quite different than for handling temperature. That’s why people looking for noise relief who simply replace their dual pane windows are often disappointed. The best solution for many people is to add a soundproof window to their existing window. That solves both the temperature and the sound problem. Are the sound ratings given by manufacturers the same? When you’re comparing how effective a window is in stopping sound, look for the STC rating. (STC stands for Sound Transmission Class.) The higher the number, the more sound is stopped. A typical rating for standard windows is between 26 and 28. A typical rating for a Soundproof Window over a dual pane window is 48 to 52 or even higher. That’s nearly double the noise reduction. Here’s an important fact. Some manufacturers don’t provide the STC rating for their entire window but instead only give the rating for the glass they use. Since the entire window needs to stop sound, disclosing the STC rating of the glass alone gives an artificially high rating. Don’t be deceived. Make sure you’re getting complete information when comparing windows. Confirm that the STC numbers provided are for the complete window, not just the glass. Can I trust the ratings being given? The only way to be certain of how effectively a window can stop sound is to review reports that come from independent, accredited sources. That way you know there are no exaggerations or inaccuracies. Most manufacturers don’t use actual test results. The ratings they publish are an optimistic “best guess” at how effectively their product stops sound. Always ask for independent test results. That way you know you’re getting the straight facts and not just a sales job. So what's my best solution for stopping noise? Simply put, the best solution is to add a special window that is designed to eliminate sound to your existing windows. Not only is it much more effective in stopping noise, it is more cost effective than replacing your existing windows. Soundproof Windows® custom builds units that install right over the current windows in your home. They have been tested and verified to be the most effective solution available for shutting out noise. Is it a long or difficult process to add Soundproof Windows®? Most people are pleasantly surprised at how fast and easy it is to add Soundproof Windows® to a home. In fact, many customers who are handy like to install the windows themselves. Since Soundproof Windows® are carefully crafted to be added to your existing windows or sliding doors, the installation process is much faster and easier than having your windows replaced. Solving your noise problem is easier than you think. The next step is to talk with someone who can answer your questions and help create a solution that’s ideal for you. Call us toll-free at 877-438-7843, or fill out the Free Estimate form, or send an email to sales@soundproofwindows.com. We look forward to hearing from you.